Tourist information and guide to golf & golf courses in Santa Ponsa, Majorca, Spain. Santa Ponsa is a great holiday destination with a perfect and relaxing atmosphere. Santa Ponsa is also best known for its golfing opportunities. Golf in Santa Ponsa is also one of the great attractions. 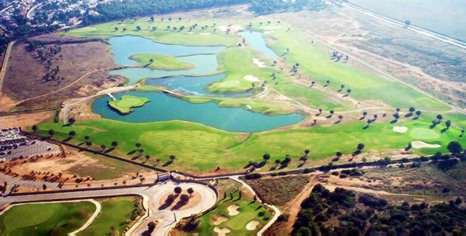 Santa Ponsa has three large golf courses named Golf Santa Ponsa 1, 2 and 3. They include two 18-hole and one 9-hole golf course. Golf Santa Ponsa 1 is public, 2 and 3 are private and for members only. Golf Santa Ponsa 1 is the only golf course open to the public. It is popular with its wide and open area that is spreading over 73 hectares. Many national and international tournaments are being held here. Average cost is about 90 Euros. Our tip if you require an official ESTA visa for your travel to the USA and are not making any progress with the application form: At www.esta-registration.co.uk, competent support employees will be glad to help you. There is also a unique, UK toll free 0808 hotline in English speaking countries.